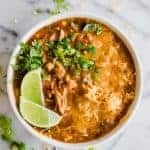 This easy to put together slow cooker (affiliate link) meal is loaded with bold flavor, hearty chunks of meat, and lots of melty cheese. Better than any soup you will get at a restaurant and perfect for loading up with your favorite toppings! Add all ingredients to the crockpot except for the shredded cheese. Cook over low heat for 6-8 hours or high heat 4-5 hours. Add in the cheese, stir, and allow the cheese to melt for about 5 minutes. Can be made on the stovetop also. Instead of adding the chicken to cook in the broth, add all of the ingredients and use pre-cooked shredded chicken. Allow it to simmer on the stove for about 30 minutes. The best part of this soup is the toppings! Some favorites are: cilantro, lime, sour cream, cheese, tortilla strips, chips.